New Skyway Monte Bianco Cable Car Opens in June at Courmayeur! The Alps as seen from Mount Blanc. Kent St. John photo. 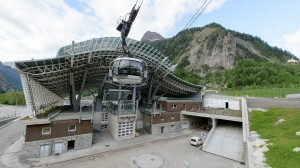 The new cable car facility will connect Courmayeur to Punta Helbronner. At an altitude of 3,462 meters, it is the closest point to the summit of Mont Blanc, exposing visitors to a majestic realm of snow and rock. Among rotating cable cars, hyper-technological stations and breathtaking vistas from beautiful terraces, Skyway Monte Bianco is the new pathway to the Italian side of the Roof of Europe. In June of 2015, the Skyway Monte Bianco cable car facility will be unveiled in Courmayeur, Italy. After four years of construction, three stations, 2,200 meters of gained height and 3,462 meters of altitude at the arriving station, Skyway Monte Bianco could soon be considered the Eighth Wonder of the World. This structure will revolutionize the concept of the cable car journey, turn it into a memorable experience and secure its role as the groundbreaking destination fostering innovation in tourism. Skyway Monte Bianco is not only a mode of transport but also part of the travel experience. Travelers easily and seamlessly experience the intense emotions evoked by this wild, beautiful landscape and mountainous terrain. Skyway’s rotating cable cars effortlessly float and glide over forests, glaciers and rock pinnacles with the Alpine ranges etched into the horizon. While traveling on Skyway Monte Bianco, participants can appreciate a 360 degree vista guaranteed by anti-scratch and anti-fog glass. Travelers can also enjoy smart technology devices on board such as screens for videos, weather reports, avalanche bulletins and timetable panels. A camera located on the floor will deliver images of the landscape beneath the cable car. Visitors can catch the Skyway at Courmayeur (1,370 m.) with the intermediate stop located at the Pavillon du Mont Fréty (2,200 m.) and the arrival point at Punta Helbronner (3,462 m.), on the Italian side of Mont Blanc. The stations are equipped with multimedia rooms, lounge areas, restaurants and beautiful terraces. These terminals represent an outstanding example of how sustainable architecture, contemporary design and cutting-edge technology can give form to an idea ­ the first-hand experience of direct contact with the natural environment. Skyway Monte Bianco cable car, openiing June 2015. The new station of departure in Courmayeur was built from scratch. At the intermediate station Pavillon du Mont Fréty, visitors will admire the ŒSaussurea¹ alpine botanical gardens. Here in the highest collection of plants of Europe, you can walk along the network of panoramic paths or relax and sunbathe on the terrace. This station also provides indoor lounge areas and restaurants. In just ten minutes, visitors can pass from the Pavillon du Mont Fréty (2,173 m.) to the station of Punta Helbronner. Here visitors will find the main attraction of the facility: a viewing terrace, which offers visitors an extraordinary all-around vista of the Mont Blanc summit (4,810 m). A permanent exhibition of crystals, a self-service restaurant, a bar and multimedia information points are located inside. Visitors can also take advantage of being close to France. Why not take the “Glaciers’ Cable Car” and cross the border for an appetizer in Chamonix? A facility connects the cable car station on the Italian side with the French side, easily linking Courmayeur and Chamonix, the two little enchanting alpine capitals. Skyway Monte Bianco complies with high standards of efficient energy use and environmental protection. This facility exemplifies the concept of “Made in Italy“ in the same year as Expo, the universal exhibition that takes place in Milan, providing a great international showcase for the Aosta Valley and the rest of Italy. The new cable car has been built with the latest technologies in order to increase the energy efficiency and reduce consumption. Insulated materials with wide photovoltaic surfaces and heating systems with electrically driven, highly efficient heat pumps minimize the loss of energy. The back-up power generators are the only concession to the use of fossil fuels. The goal is to meet the ŒZero-Energy Building¹ standard, meaning buildings produce the energy they need without assistance.